I have spent the entire weekend decorating for Christmas. I would say I'm about 90% done. I just need to add a few little touches here & there. I wanted to share my dining room table vignette with you. 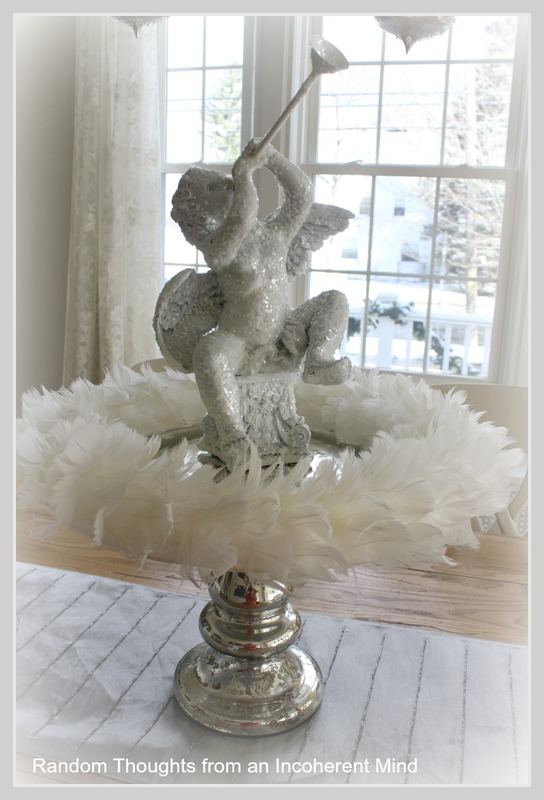 Over the summer, I bought this amazing mercury glass pedestal at Williams Sonoma. It's quite large & they tell me that they had just added it to the clearance table seconds before I walked in. There was an additional 20% off all clearance that day. It was meant to be I guess. I stole it bought it for $12.00 & change. I ended up changing the taper candles you see here. I thought something taller & with a little sparkle would be better and sure enough, it was. It's really a wonder I was able to get this angel. I saw him at TJ Maxx last week. I really loved him & carried him around the store for a bit, but managed to talk myself out of buying him. The second I took out the mercury glass pedestal, I also grabbed my white feather wreath & immediately a plan came together, if only I had bought that angel! As luck would have it, I texted my sister to see if she was out shopping. She was & was willing to go to TJ Maxx & see if the angel was still there. Incredibly, he was. I don't know about your TJ Maxx, but with ours, if you don't buy something the minute you see it, it will most likely be gone should you go back for it the next day. I was lucky this time! I had to take the above photo so I could show you the snow in the background. We had our first snowfall! Here's a different view. Notice my chalkboard all set for Christmas. I thought Joy to the World seemed appropriate with my angel sitting nearby. So tell me, have you begun to decorate and if so, are you finished yet? Yes, I've been decorating but not as much stuff out as last year it seems, my tree is decorated just have to add the bows and I'm done with it. Very pretty, Gina! How lucky your were to get the angel! It's beautiful! Decorating is last on my To Do list right now! lol! I have to put fall away! That whole vignette came together perfectly. All made for each other! Beautiful! I have not started yet. I hope to get busy next weekend. I still have fall decorations up! Of course it is just beginning to look like fall in South Texas. Oh so pretty. Love your new angel and the new piece from W & S. The pictue with the real snow outside is perfect. I have started, very slowly I am afraid. WOW Gina you waste no time:) I have very little done. I love your chande and the chalkboard is cute too. Gina, you have been very busy! This is lovely and what a deal! Your home is looking lovely and very festive! I haven't started decorating yet! I have to get busy! Thanks for the inspiration! everything at home and try to get a little rest. Ha! Ha! Your table and your snow looks great! Haven't started. My mother is back in the hospital. I hope to get a start this week. That angel was meant to be on your dining room table. It's perfect under the added touches of elegance on your chandie! We also had some snow but now it is all gone, still very cold. 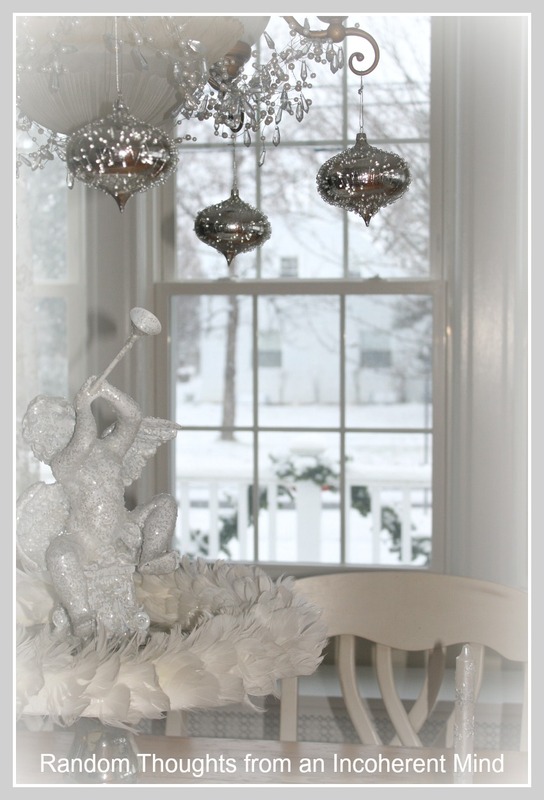 Love the angel and how you decorated the chandy...very festive!!! 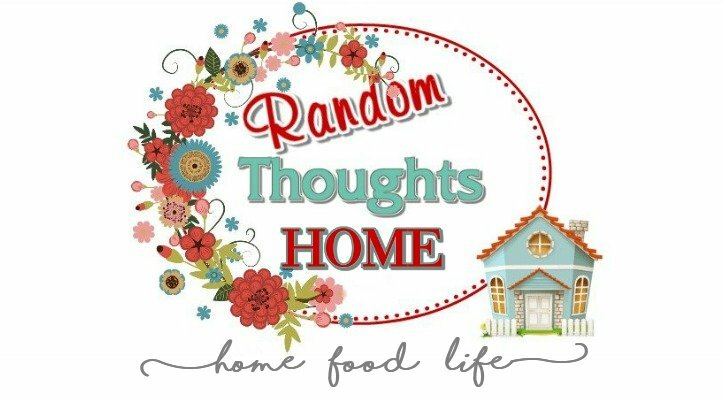 I am still putting away Fall decor, washing windows, putting up clean curtains and hunkering down for winter.....and endless craft projects, new ideas keep popping into my head!!! Sooooo pretty Gina!! I love the way you dressed your chandy up too! Gina looks pretty I'm not sure if you got my email it seems to not be working, Anyway love everything your doing..
Not yet. But I'm settled in inspiring and deciding what way I want to go this year... until I saw your lovely Angel setting... and the snow falling outside. I love those objects we wait to have and then battle to keep. This is one of them. Well done, Dear Lady! You're heading for Gorgeous, Soothing and Peaceful - all that the Season should be. Happy Holidays! I have those same angels on my mantel. I spray painted them gold. Gina,I'm so jealous!....isn't that snow I see out your window?? ?..send some south!! Love your Christmas decor,I have not yet started,but you inspire me,I'll get with it soon. Thanks for visiting,I'll think of you when I slice another piece of cake with coffee around 4. Gina, I love mercury glass too. I think I have similar angels (which I adore) only they're not covered in snow. Looks pretty, and a lesson learned... never ever reject an angel. A beautiful marriage of three beautiful things ! 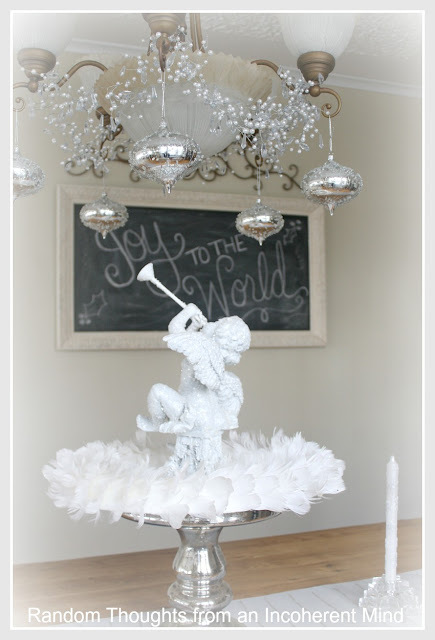 Oh, I love your centerpiece and the little angel surrounded by feathers! Just perfect. Beautiful Gina! I'm glad you were able to still get the angel! Our store is like that too! I can't get over the price you paid for the WS piece! Awesome look for an awesome price! Looks beautiful!! I love the ornaments hanging from the chandy. Is that a type of garland there too? I have hung white icicle lights out on my patio and a wreath on my front door ~ that's it! My daughter's house looks like a Christmas wonderland! I so hope she will allow me to share photos. I got out tubs of Christmas today ~ we shall see how far I get! :) Oh, and it's been in the high 70's here...79 Thanksgiving Day. Something about that is just not right. It was meant to be for you to have that angel! The entire vignette is beautiful especially with that snow in the background! I have a real "mess" in the house right now. Had to clear off the table just so we would have a place to eat! Oh Fina I love it, silver is such a great alternative to green and red! Snow, oh no! It sure is pretty though! Wow, Gina, that is absolutely stunning! I'd say you did "steal" that mercury glass pedestal -- it's beautiful, and so is the angel! Adore your chandy decor. Beautiful vignette Gina. Yes, Joy to the World if perfect with your little guy blowing his horn. Great bargain, glad your sister was out shopping and could pick him up just for your table. Sso happy for you to get the pedestal and the angel. I'm very jealous of course but you're such a nice lady you deserve it. Your home is so gorgeous. Guess I'll have to give our new T.J. Maxx a better look around. see if they have any of the gorgeous goodies you have. I'd love to find a feather wreath like yours, so pretty and soft looking. We're not doing as much this year, inside or out. We're by ourselves for the holidays so we don't feel as inspired to do as much. Much as I love to get the place all snazzied up it's gotten to be almost too much, but we're older, early 70's. Just gorgeous, Gina! 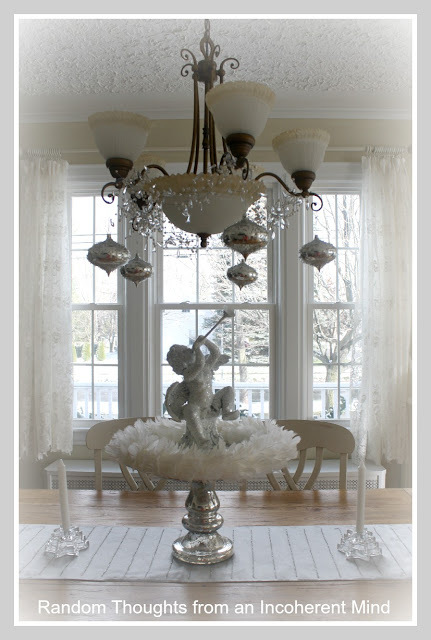 Love the decorations on your chandelier and the angel is beautiful! Very pretty! The giant whoosing sound is Debbie running to her cabinet to pull out pedestals. That looks great. I love blog land. It is just so full of inspiration. Oh sweetie was this ever meant to be. For one thing, can't believe that the angel was still there. Adding the feather wreath was a fab idea. It all looks so magical. The snow was a gift from heaven. Made special for your vignette. I have a mercury glass pedastal like that. Lucked out and found it at a trash and dent discount store for $10. I felt like I had stolen it also. lol! I would love if you would link this to Share Your Cup tomorrow! p.s. I'm about 90% done also. I'm keeping things simple this year. I'm decorating with votives, candles, poinsettias, and fresh greenery in a couple of weeks...I'm adopting a more European approach because we've been so overwhelmed with Trip's mom and everything. Everything is gorgeous. I am done too! Love doing it - it is my favorite thing besides the Christmas music. That pedestal is fabulous. Yes, TJ Maxx/Home Goods appears to be the same everywhere. Wish their buyers would buy more, more more! I adore your setting and the chalkboard is wonderful. I want to get one. It is so cute! Gorgeous decor Gina. I love how you dressed the chandelier. You have some fabulous mercury glass. it's stunning. What a terrific centerpiece! I absolutely love it! I love that centrepiece. We finally have snow here so I am truly motivated to start decorating.